Spring for me means intensive teaching. Presently doing Video 101 for photo­graphers in LAMK (Lahti University of Applied Sciences). As always, enjoying it immensely. I asked the students in three words describe what they feel is essential in a good film / documentary. And to make things more interesting: one word had to be a noun, one an adjective and one a verb. On the black­board (image above) I listed what we came up with. The X-sign means another student had the same word as his/her choice. Some words might require expla­nation (such as “leivos” i.e. a small cake), but the student explained: the several layers it contains… Makes sense. 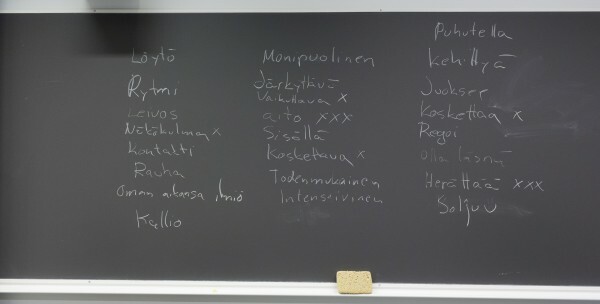 You have to understand Finnish to read it, but the top results (14 total) can be summa­rized by this clumsy trans­lation: a good piece is genuine/real , it touches you/ reaches out to you and it makes an impression / a mark on you. It makes you wake up / alert and it has a unique point of view. Somehow in my mind I do make a connection to what Steven Soder­bergh said in San Francisco two years ago, when he was talking about art and cinema as a “speci­ficity of vision”. Here is a snippet of the talk (from @ c. 11.30 min) and the whole piece can be seen here. The whole speech is worth seeing (it is truly illumi­nating) but if you are really impatient, start at 9:30 where he talks about art. My personal choice of the essential three ingre­dients? Strange isn’t it? Something on your mind and suddenly, everything seems to point to the same direction or be involved somehow with the same themes and issues. I believe that all great art holds the power to dissolve things: time, distance, diffe­rence, injustice, alienation, despair. I believe that all great art holds the power to mend things: join, comfort, inspire hope in fellowship, reconcile us to our selves.